Published to commemorate the 50th anniversary of John F. Kennedy’s election as president of the United States, this book is a revealing and intimate portrait of a leader, husband, and father as seen through the lens of Cecil Stoughton, the first official White House photographer. Stoughton’s close rapport with the president and first lady gave him extraordinary access to the Oval Office, the Kennedys’ private quarters and homes, to state dinners, cabinet meetings, diplomatic trips, and family holidays. Drawing on Stoughton’s unparalleled body of photographs, most rarely or never before reproduced, and supported by a deeply thoughtful narrative by political historian Richard Reeves, Portrait of Camelot is an unprecedented portrayal of the power, politics, and warmly personal aspects of Camelot’s 1,036 days. 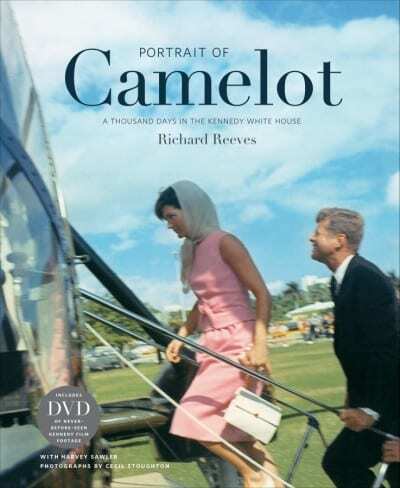 DVD INCLUDED: packaged with a DVD created exclusively for this book, containing color and black-and-white film footage Stoughton created of the Kennedy family in the White House, in Hyannis Port, and on holidays. Harvey Sawler interviewed Cecil Stoughton extensively before the photographer’s death in 2008. Richard Reeves has received dozens of awards for his work in print, television, and film. He is Senior Lecturer at the Annenberg School for Communication and Journalism at the University of Southern California, Los Angeles. Like the TV series Mad Men, this book is also a remarkable period piece...informative and beautiful.